is a Canada-based exploration company focused on the acquisition and development of production-grade cobalt deposits, a key raw material input for the growing lithium-ion battery industry. Pacific Rim Cobalt and its Cyclops Nickel-Cobalt Project, located in the Depapre District, Jayapura Regency, Papua Province, Republic of Indonesia, is uniquely positioned in a region with potentially the largest source of cobalt outside of Africa. Strategically located near China, the world’s largest cobalt buyer, the Cyclops Project is a laterite (iron-hosted) mineral prospect, rich in cobalt and nickel. Cobalt consumption in China is on-track to use over 8,000 tonnes of cobalt annually by 2021 for electric vehicle production alone and is projected to remain the world’s largest cobalt consumer for many years to come. Global demand for renewable power is fueling a massive shift from traditional energy supply chain economics to cobalt-reliant lithium-ion batteries, the world’s most widely used power source for portable applications such as electric vehicles and other high-tech applications. Pacific Rim Cobalt management has concluded that strategic access to major markets offers the most important factor to servicing the rising demand for cobalt. 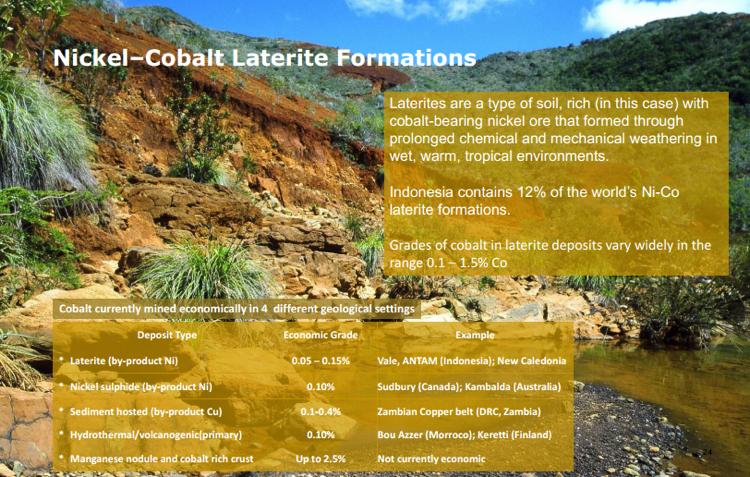 The company’s acquisition of its initial asset in Indonesia offers near surface, strong nickel-cobalt mineralization in an area with excellent infrastructure including a nearby workforce, supplies, sealed roads, ocean access, nearby port facility and gentle topography. 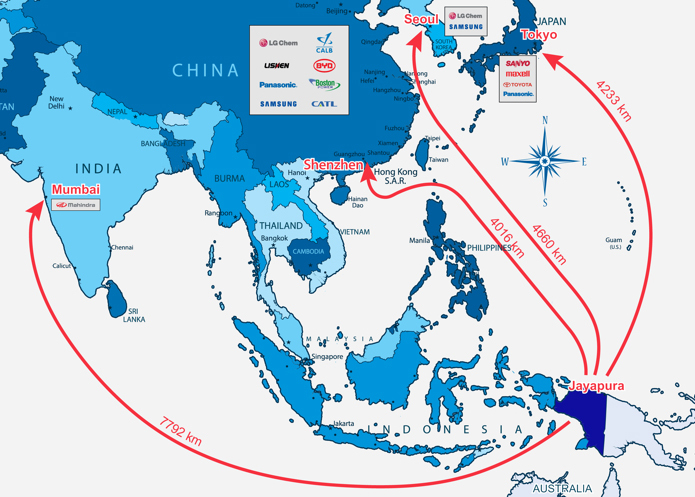 The project area, nestled on the north coast of Papua, Indonesia, establishes Pacific Rim Cobalt well within the economically attractive ocean-going transportation range to Asia and its lucrative, growing industrial markets. Exploration efforts are currently focused on establishing a maiden compliant resource for the Cyclops project, both in historically identified and drill-tested prospects as well as previously unexplored areas of the claims. During the first nine months of 2018, the company focused on assembling the necessary agreements to access northern areas of the project hosting historically identified mineralized zones. Mapping, sampling and a mini-bulk sample within the mineralized zones has been completed, along with a small-scale program in the previously unexplored far southern area of the project. With surface access to priority targets now established, Pacific Rim Cobalt will initiate drilling and extract additional mini-bulk samples for further metallurgical testing. Pacific Rim Cobalt’s world-class management team includes Sundher, who has over 20 years of capital markets experience. Sundher is also president of Canrim Ventures Ltd., a Singaporean advisory firm specializing in early stage project finance and structure. He previously founded Indogold Exploration, a Jakarta-based mining service firm, and has raised over $40 million for companies in which he was a founder/partner. Chief Financial Officer Steve Vanry has 25 years of professional experience in senior management positions with public and private natural resources companies, providing expertise in capital markets corporate finance, mergers and acquisitions, regulatory compliance, accounting and financial reporting. Andre Talaska serves as country manager and technical supervisor. He has over 30 years of experience in the mining and exploration industry and has held senior positions with several companies in Australia and southeast Asia. Shakir Juffry, business development/engineering, is a chemical engineer and extractive metallurgist by background training who has over 20 years of experience in the Indonesian mining and minerals exploration field. Toto Suarto Sajali, operation and development manager, is a mining engineer with over 15 years of experience in Indonesian project assessment, development and operations.